Retirement calculators that you use online are typically too simplistic. You can’t easily compare multiple scenarios, you can’t input future withdrawals, and you can’t input different contributions for different years. These problems leave most online calculators with much to be desired. Several years ago when I first started this website I made a retirement tracking spreadsheet that solved some of these problems but it was ridiculously complicated. I stopped using it for my own tracking purposes for this reason. 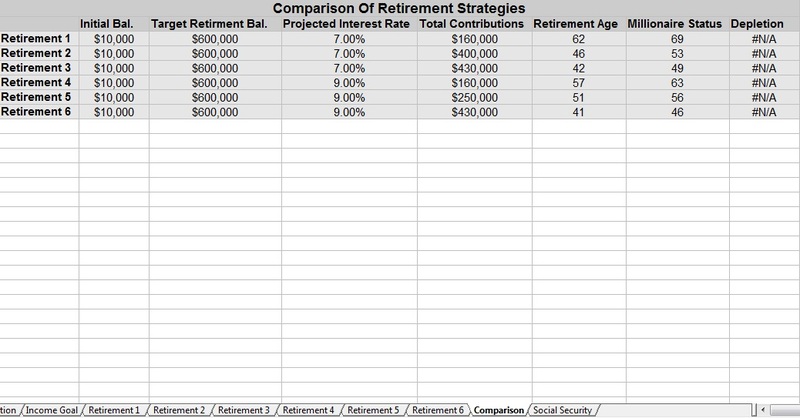 Since then I have put a lot of planning and effort into building an easy to use and extremely beneficial retirement planning spreadsheet. 1. Calculate desired retirement amount: In the first sheet you enter how much money you would like to have available to spend per month. Then the sheet calculates how much of a nest egg is needed to reach that level of income based on differing withdrawal rates. This sheet also includes links to articles which talk about different withdrawal rates. 2. Allows independent inputs for contributions and withdrawals for each year: No two years are the same. Since I have started investing I have never contributed the exact same amount to retirement accounts across 2 years, let alone 30 or 40 years. The ability to have these numbers change with every year make this a much more powerful spreadsheet. 3. Compare 6 different retirement scenarios, with a separate sheet that lists them side by side. This sheet is extremely important in determining which method of contributions is best for you. It also makes it easy to compare scenarios with different interest rates. How I personally use this sheet is that I have 2 sets of 3 different contributions scenarios, I then use the 2 sets to model different interest rates. 4. Easy to use User Inputs and User Metrics section. For the User Input section the user only needs to put in their starting balance, estimated interest rate, retirement target balance, and age. The User Metrics section calculates what year you will hit your retirement target, what year you will become a millionaire, and what year, if any you will deplete your nest egg. It also adds up the total of all contributions made. What’s really fun about this section is that if you keep one sheet as a “to date version” you can see when you can retire without adding anything extra to your accounts. I think this section is a major motivational boost. With such a long term goal it is nice to see exactly when you should cross your retirement threshold and when you will pass the million dollar threshold. 5. Calculates Social Security benefits: This sheet is updated with all the numbers from the Social Security administration for 2018. There is a chart that shows exactly what someone’s benefits will be at age 62, 65, 67, and 70 with differing AIME’s (Average Indexed Monthly Earnings). There is also a spot to input your exact expected AIME and that of your spouse and the sheet will give an exact number for your retirement benefits. Your AIME can be retrieved from visiting SSA.gov and signing up for an account. 6.. Versatility: One of my primary financial goals is to assist my children with building a nest egg early in life. The primary mechanism for this will be matching funds for their retirement accounts. Depending on our ability we will match either 50 cents on the dollar, $1 for $1, or $2 for $1, with a max of $X per year for X years. Using this spreadsheet for our kids all I have to do is change the name on the withdrawals column to “matching contributions” and enter positive numbers instead of negative numbers to account for our matching contributions to our kids retirement accounts. Any feedback on this spreadsheet would be greatly appreciated. I want to continue to improve this spreadsheet (as well as the federal income tax planning spreadsheet and mortgage payoff spreadsheet), and the only way to do that is to receive user feedback. In addition to using this spreadsheet I also use Personal Capital to track my wealth building over time. 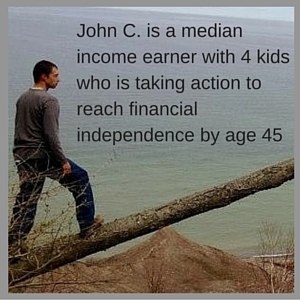 It’s a free tool and does an excellent job of bringing all my separate accounts to one place. Do you track your financial future using spreadsheets, online tools like Personal Capital, or good ole fashioned pen and paper? 5 Responses to "New Retirement Planning Spreadsheet"
Living in Israel, Personal Capital does not work with the banks here so I do some manual updating. I use google sheets so I can access the numbers from anywhere. The part I like most is the option to add a script to the background of the spreadsheet. For instance I have a script that sends me an email at midnight every night with my current NW and current investments and changes from the previous day (I know I shouldn’t check on a daily basis, I can’t help myself). I have a sheet with all my tax lots and a script that sends me an email when I have a TLH opportunity in on of the lots. I also get sent an email when my NW or investments crosses a multiple of 100k milestone. It’s amazing to see the time between each subsequent 100k get smaller over time. also, you may consider taking your last name off the file. Thank you, I will take a look at making that change. Thanks for the heads up on my last name in the metadata . On your social security, you work full time but for only part of the year. I know SS requires 40 quarters and requires a certain amount of income in each quarter. You must have 40 quarters to qualify for medicare part A as a free benefit. How does this affect your early retirement strategy? Most of my jobs span between the quarters so it’s rare I have a quarter without earnings. I’ve had all 40 credits for a while.